This cake is my current go-to for birthdays and other celebrations. 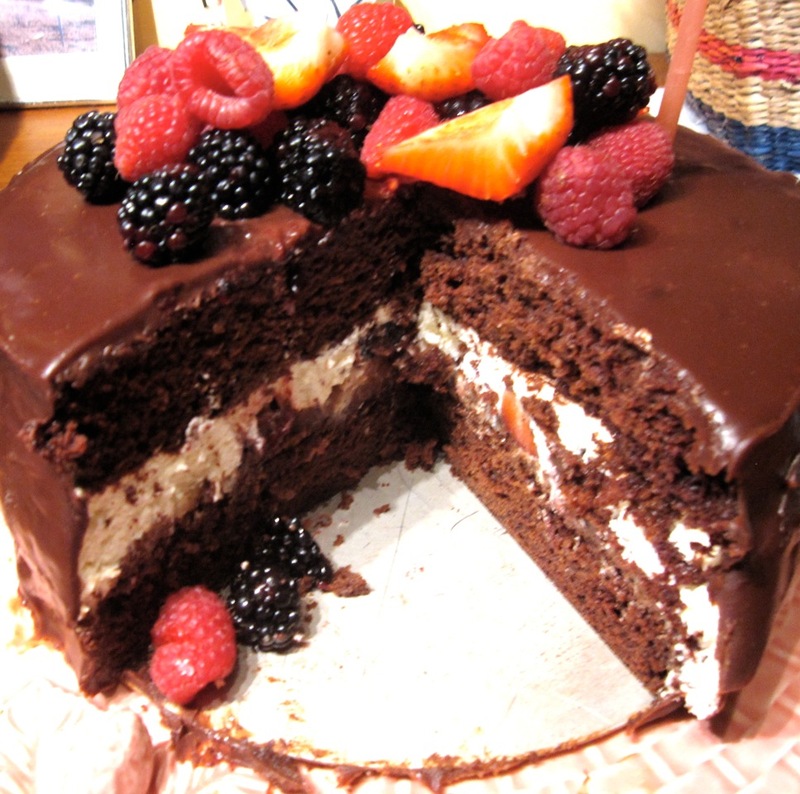 Two layers of chocolate cake, a deep, dark chocolate caramel ganache and a layer of gelatin fortified, lightly sweetened whipped cream provide a dramatic background for a mélange of raspberries, blackberries and strawberries. This cake looks much more difficult than it is; a 9-inch springform pan helps all the layers stay in place. 1. Have the two 9-inch layers of chocolate cake baked and cooled. Trim if necessary to form level layers. Have a 9-inch springform pan on hand. 2. For the Ganache: Place chocolate in a medium sized heatproof bowl. Place sugar and water in a deep saucepan. Stir to wet sugar. Bring to a boil over medium-high heat, swirling pan occasionally. Dip pastry brush in cold water and wash down sugar crystals from the sides of the pot once or twice. Increase heat and cook without stirring until sugar is a deep amber color. Remove from heat and gradually add cream (mixture will bubble vigorously). Stir over medium heat until any hard caramel bits dissolve. Pour over chocolate. Allow to sit for a few minutes for heat to melt chocolate. Whisk gently until smooth; whisk in vanilla and let cool slightly, but it should still be fluid. Place 1 cake layer in springform pan. Pour 1 cup ganache over the cake and use a small offset spatula to create an even layer. Chill briefly until cool to the touch; meanwhile continue with recipe. Reserve remaining ganache and let stand at room temperature. 3. For the Whipped Cream Filling and Initial Assembly: Place water in a small microwaveable bowl. Sprinkle gelatin over; let stand until gelatin softens, about 10 minutes. Place in microwave and heat in 100% High power in 10 second increments until melted; set aside. (Maybe also be melted on stovetop in water bath). Place cream, powdered sugar and vanilla in a large bowl. Beat cream with an electric mixer until soft peaks form. Add gelatin and continue beating until firm peaks form. Scatter 1 cup of strawberries and ½ cup of each raspberries and blackberries over chilled ganache. Spoon whipped cream filling over berries. Place second cake layer on top and press down gently. Cover tightly with plastic wrap and chill until cream layer is set, at least 6 hours or overnight. 4. For the Final Assembly: Remove sides of springform pan. Using a small offset spatula to smooth the sides. Place the cake on a wire rack set on a rimmed baking sheet lined with parchment paper or aluminum foil. Rewarm remaining ganache until just pourable but not hot. (Microwave in a microwave-safe bowl, or heat in top of double boiler). Pour ganache over cake, tilting cake to facilitate ganache dripping down sides. Use an offset spatula to help spread ganache, if needed, to cover sides of cake, but work quickly and use a light hand so that whipped cream doesn’t “bleed” though ganache. Chill until ganache is set, about 3 hours or overnight. Remove cake from refrigerator at least 1 hour before serving and up to 3 hours before. Right before serving, arrange remaining berries in an attractive pile on top of the cake.